aligned. In August 1957 I finished my BA degree at the University of Minnesota. At the same time I received a phone call telling me of some upcoming excitement in the area—a manned balloon flight into the stratosphere was being filmed for a CBS science show. E. B. White was then one of the best-known writers on the magazine, but his shyness, I found out later, was of mythic proportions, and this interview quite unprecedented. He seemed pained to be in the presence of anyone at all, much less a corn-fed girl from Iowa who was looking for a job. “What sort of work do you envision doing, Miss Groth?” His handsome, fine-featured gray head was lowered, his eyes cast down, his voice little above a whisper. I was overwhelmed with a desire to put the poor man at ease. “Not at a professional level,” I said. He coughed and looked at the résumé that Arthur Zegart had given him and that had led to my being there in his office. “What about this short story prize you won? I told him that yes, of course it had been, but that I deliberately maintained a slow, self-devised system that involved looking at the keyboard. For the first time Mr. White looked directly at me. “And you don’t want to wind up there?” he asked. I suspected that he had some sympathy for the course I had taken. “No, I think anything would be more interesting to me than that,” I said. How rash and how fateful that course turned out to be! After a few more questions, Mr. White concluded the interview by calling into his office Miss Daise Terry. I later found out she was a formidable figure around the magazine, its manager in charge of secretarial personnel. A petite woman of four feet nine or ten, no more than five feet, even in inch-and-a-half heels, she had a cap of tightly curled white hair and a slash of geranium-pink lipstick in a face dominated by piercing blue eyes. At perhaps sixty or so, she needed no glasses. “I will,” she said, asking me to come with her. I learned that she, too, was from the middle of the country, having left her native Kansas in 1918 to join the International Red Cross, and had wound up in New York after some years serving in Vienna. I said I would keep that in mind. “At the moment,” she said, “we have an opening at the reception desk down on eighteen—that’s the writers’ floor. I said that sounded fine. We shook hands, and I was officially a member of the editorial staff. —as they always say, it’s not who you are but who you know. And so far, my story was typical, if a good deal luckier than most. ere was every reason to suppose that if I didn’t leave to marry, in the course of a year or two I would be joining the trail of countless trainees before me, moving either into the checking department or to a job as a Talk of the Town reporter, and perhaps from one of those positions to the most coveted of spots, that of a regular contributor with a drawing account. Yet with the exception of one six-month stint in the art department, I did not rise from my initial post. didn’t know, either, what in the world to do with me. messages, too, along with impressions, confidences, and an education in a variety of subjects. I was there, among the men and women who wrote and edited the magazine, for longer than many of them were. I watched their comings and goings, their marriages and divorces, their scandalous affairs, their failures and triumphs and tragedies and suicides and illnesses and deaths. pieces) who blew my cover, all unintentionally. I’m sure he never guessed that I had been trying to keep a lid on my failure to advance at the magazine, imagining that I could hide it from the world at large as my own guilty secret. belies its reputation for institutional eccentricity. We have some writers and editors around who could pass for bankers and who, as they walk toward the New York Yacht Club on West Forty-fourth Street, could not unreasonably be expected by passersby to continue on inside. And yet we do have our authentic oddities. Jan Groth is surely one. She is finishing her Ph.D. dissertation in English. She has taught that subject at a high academic level. (She also writes an elegant Italian script.) 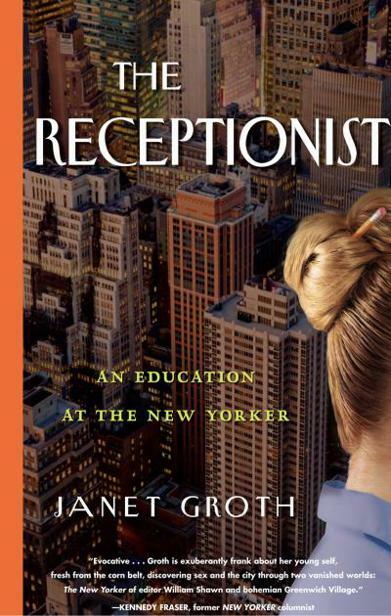 But in twenty years or so she has never risen at the magazine—possibly of her own volition, though I doubt it—beyond being the eighteenth-floor receptionist, which is where she started off. We who spend many daylight hours there, mind you, are delighted with her permanence. She takes our messages when we are away from our desks, as we often are; she has learned to recognize the voices of our wives and children. As in our absences she comforts our friends, so when the occasion demands does she protect us against our enemies. ere was, for example, the brilliant fact checker Dorothy Dean, who gave off manic vibes so electric they created a people-free zone of a ten-foot radius wherever she went. would rank high in any listing of authentic oddities, and among our numerous hypochondriacs, Freddie outcomplained a roster of champs in that department. His best moment may have come when he famously began his reply to a colleague’s routine inquiry into his health with “Well, I’ve got these two colds . . .” Freddie would have felt vindicated by a recent piece in Science Times declaring it perfectly possible to have two colds—a head cold and a sinus cold—simultaneously. Others with colorful, weird propensities included the editor Rogers “Popsy” Whitaker—who, despite a perpetual frown, a thrust-forward lower lip, sagging suspenders, and a portly form, was inclined to pitch rose-laden woo at spoken-for damsels on the editorial staff—and the writers Maeve Brennan and St. Clair McKelway. Miss Brennan and Mr. McKelway were once young marrieds down in the Village but in their later years, split from each other, shared histories of colorful breakdowns. Miss Brennan, hoping to add height to her tiny frame, teased her red hair into a five-inch beehive, which, in her bouts of lost perspective, turned into a terrifying tangle as she forgot to give it the occasional brush. Mr. McKelway went in for crayoning the office walls periodically with shocking signs and logos that necessitated early morning scrubbings-down. was a place with broad limits of tolerance for unusual looks and behavior, a haven for the “congenitally unemployable,” as Rogers Whitaker and A. J. Liebling are both reported to have said, but I had never thought of myself as belonging among them. he divides residents into three types. e first are the native born, the second the commuters, and the third—the source of the city’s vitality, élan, and magical “deportment”—are those who come to it from the hinterland, the ones for whom the city is their destination, “the goal.” I came as one of the third type. What happened after I got there is a more complicated story.